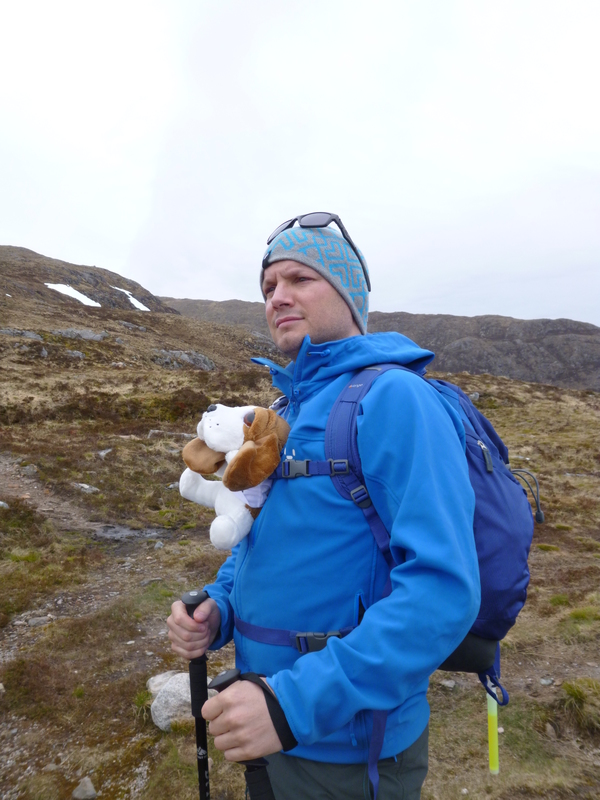 Saturday saw me and five guys I work with take on walking a large section of the West Highland Way. I’m leading this team in the Caledonian Challenge in a few weeks time and this was a weekend I designed to be as physically and mentally tough as possible to make sure the team is ready. We assembled in our Edinburgh office from our distant outposts. Amongst us we had people from Aberdeen, Fife, Auchterader, Glasgow, Oxford and Hampshire. Those latter two made the drive up to Edinburgh on Friday morning with a 5:30am start, which made their weekend achievements even more impressive. After a kit check in the office to ensure we all had the appropriate items, we headed out to fuel up at an Italian in Edinburgh. Once we had carbed up, we went back to the office to wait out the evening before eventually driving up to Fort William. We stopped en route to leave two of our four cars at Bridge of Orchy which was our target end point for the walk. 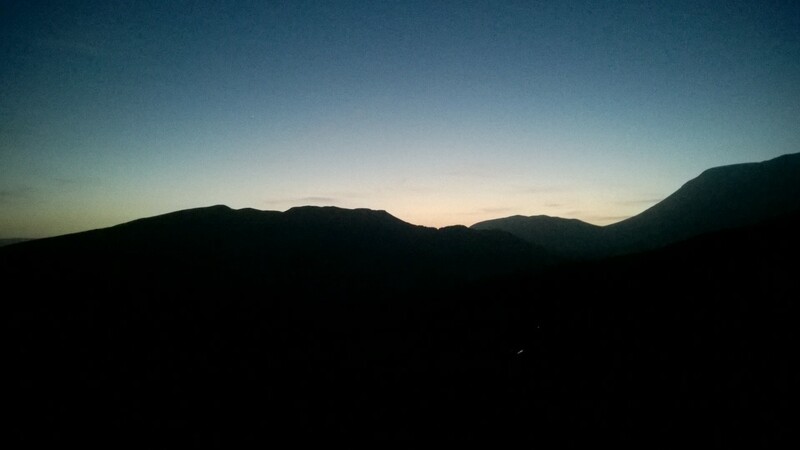 1:40am saw us arrive in the Ben Nevis visitor centre car park on a cold, crisp highland night. The stars were out and the sun had just about dipped below the horizon. One of the things I love about Scotland is how bright the nights are during the summer. On the challenge itself, we will be just about at the longest day of the year. That means that assuming the weather behaves itself then we should have bright night skies to accompany us along the night time sections of the walk. After final adjustments by headtorch in the car park, we attached glow sticks to everyone just in case of emergencies and set off up a forest fire road following the WHW markers. The cold air spurred us on and before long we were well into Glen Nevis and heading south. With no view to distract us and the nerves of the day ahead still fresh in the back of our throats, we were subdued for the first hour as everyone got into their own rhythm. 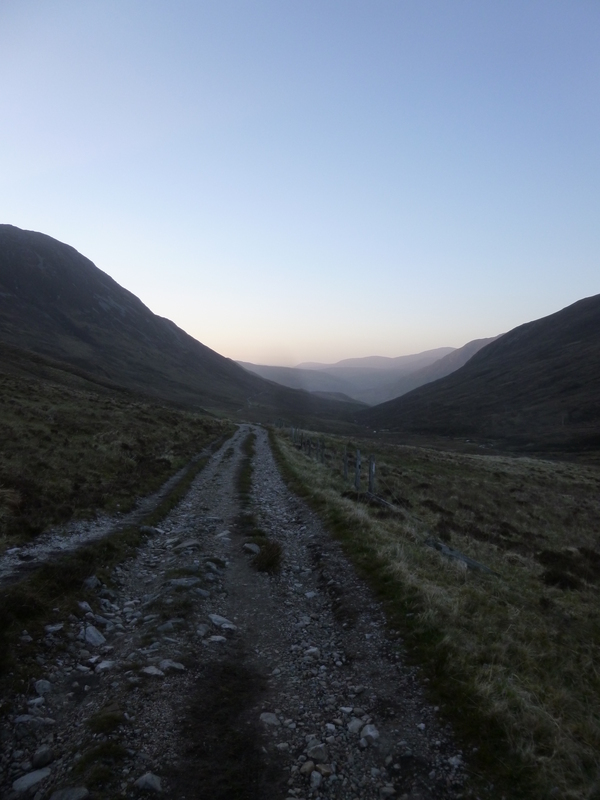 After a couple of hours, we had plateaued into the entrance to Lairigmor and we started to recognise that the sky was taking on a feint glimpse of light. By now the cold was biting and with the fatigue from the previous day, everyone was starting to drop a little. As the darkness turned to twilight, I suggested we stop and make tea and take on some snacks, ensuring everyone got some warmth inside them and some food. We still had a couple of hours to get to Kinlochleven and an even longer day ahead of us after that. The tea and snacks did the trick, lifting everyone’s spirits and giving the sky some time to fully expose the beautiful scenery we were surrounded with. The WHW is generally made up of rough stone tracks and this section was no exception. The going was great, the weather was looking good and everyone was in high spirits. 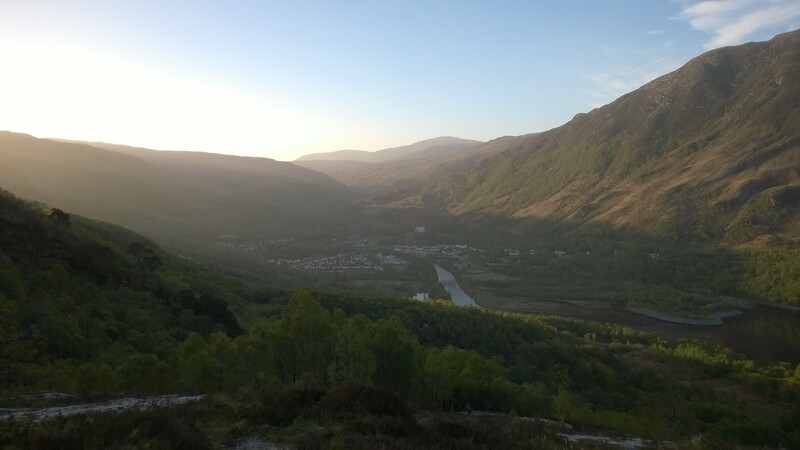 Before we knew it, we were emerging at the end of the mor and overlooking Kinlochleven, which by this time at 6am, was still fast asleep. Nothing else for it, but out with the tea making facilities and take a pew. As we sipped our early morning brew, the sun made its first appearance of the day over the hills to the east, bathing both the town below and us perched high up on the surrounding hills in lovely warm sunshine. I’ve seen it many times from years in the army. That warm bath of sunlight can lift anyones spirit, no matter how low they might be. Kinlochleven, and more precisely the Tailrace Inn, served as our breakfast spot, which by this point felt like our third breakfast, or even lunch. The landlady was surprised to see 6 worn looking walkers waiting for her as she opened the doors at 8am. After a hearty breakfast, the first big climb of the day awaited. 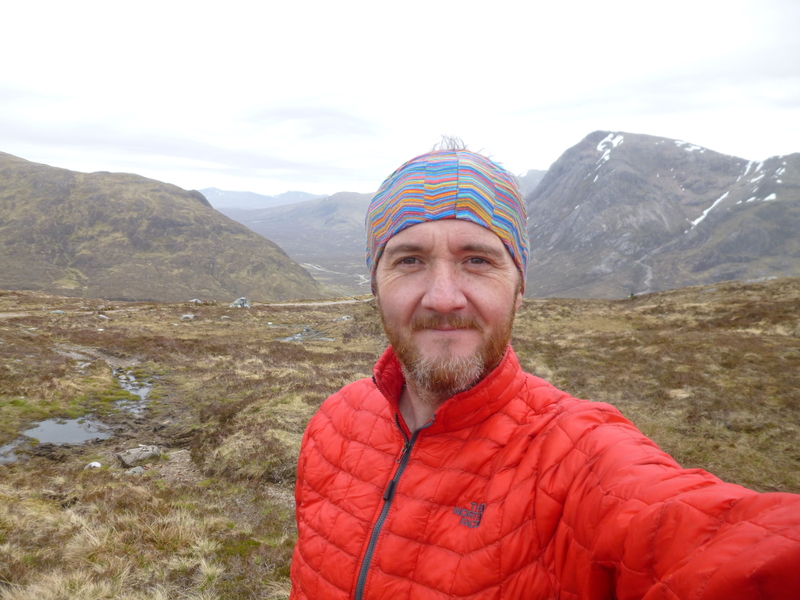 The ascent out of Kinlochleven is a steady climb that saps tired legs. By the time we got to the top of the first section which is mainly well laid track, our group was strung out over a few hundred yards. 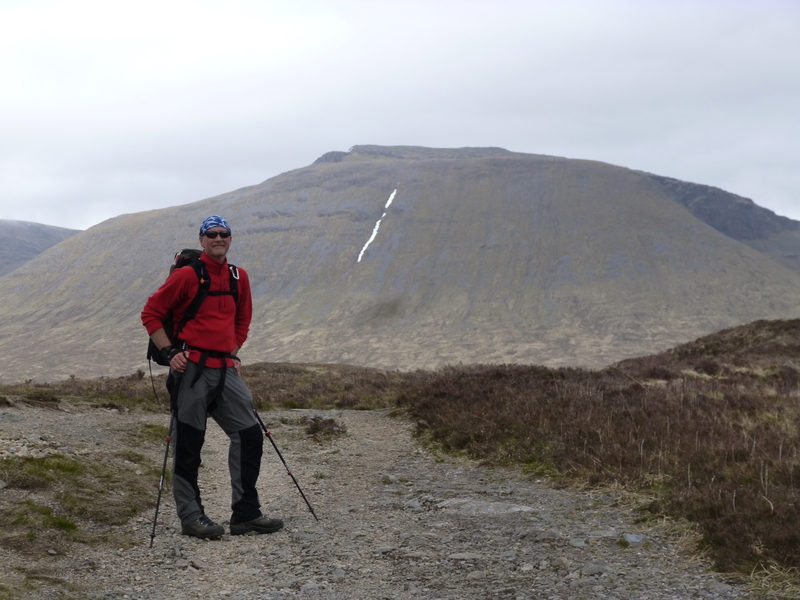 We regrouped at the top, took in some food and water and the spectacular views to the east and Blackwater reservoir. Going from this point was easier on the legs and we eventually peaked at the top of the Devils Staircase. This is an iconic spot along the WHW and gives you the first view when heading south into Glencoe. It is a mighty view and gives you a thump in the chest as Buachaille Etive Mor looms up in a commanding position across the other side of the glen. We took our time on the top here, having plenty to eat and drink and savour the views. We were all surprised by the number of tourists making the trip up from the layby down in Glencoe. Most of us forgot the time, only to realise it when we talked to some folk on the top who gave us funny looks when we explained where we had come from. At this point it was 10am. Dropping down the Devils Staircase into Glencoe, we passed a big wave of people on their way up, our minds however were now on Kingshouse hotel and our next rest stop. Once down in the bottom of the glen, the WHW takes a fairly simple route with little to distract you away from the spectacular scenery. As we got closer to Kingshouse and our lunch, we passed a group of three ladies who recognised our hiking hound and cheered us on as they too were on their final walk before doing the challenge. Kingshouse delivered the promised lunch we were all craving at this point and after some attention to blisters and packing of kit, we were heading across the road to the Glencoe ski center and the long path over Rannoch moor. This is bleak country with little to distract the eyes. 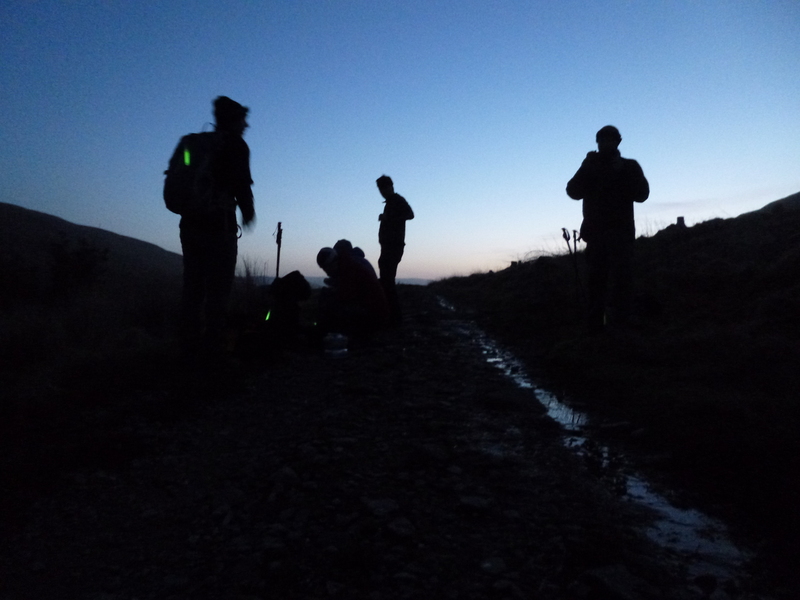 Despite the recent food stop, some of our team started to feel the weight of the last 12 hours and the early start weigh heavy on their shoulders and our pace dropped significantly. I expected this around this time, most of us had been up over 36 hours at this point and the time of day was becoming irrelevant. Conversation amongst the group tailed off and we started to get a little strung out. On the day of the challenge we have to stay within 100m of each other for good safety reasons, so this is something we will have to watch out for and address during the event. Despite the fatigue, the long path over Rannoch moor eventually deposited us down into Inveroran. From here it was one final small climb over the hill into Bridge of Orchy and our waiting cars. The day wasn’t over though, we still had two cars to recover from Fort William and a trip down to our hotel for the night in Crianlarich. We eventually made it, 5 minutes before the kitchen closed. With food orders placed, pints in hand, we all acknowledged what an epic day it had been. That strange exhausted tiredness you only get from ultra long exertions and its subsequent high upon finishing was clearly written across everyones face. We learned a lot of lessons over the weekend. Packs need to be light, we need less stuff for on the march, we need to pace more effectively and we need to do the challenge as a team and not individuals. All told, it was the perfect training exercise for what will be a tough challenge that we are all now looking forward to. If you want to support us, please donate so we can raise as much money as possible for Foundation Scotland.